Commissioning a portrait is such a risk. Will my darling dog’s spark shine through? Will the result be technically brilliant but empty? Well, hand over your favourite photo to Amanda and r-e-l-a-x. Her portrait of Minty is of course technically brilliant but, most importantly, every last tiny bit of my very special dog’s extraordinary character shines through. Thank you Amanda. This portrait will be make me smile for the rest of my life. 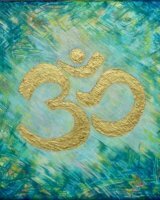 I know Amanda through her energy work, which is how I came across her original ‘Om’ painting. I loved it so much, my mum commissioned a similar but smaller one for my birthday. At her request, I gave Amanda a vague idea of the kind of colours I liked, but as the artist I left the rest up to her. The outcome was even better than I could have imagined. I love this painting on so many levels and I have hung it beside my bed for protection at night whilst I am sleeping. I have become increasingly aware of different energies around me and even an angelic presence so this painting is very special to me – thanks to my Mum and Amanda for a brilliant birthday present! Amanda Roussos is an incredibly talented artist. 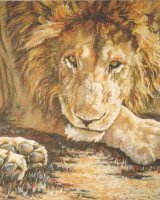 I commissioned a painting of a lion from her a while ago and was quite specific about the kind of feel I was looking for. She listened to what I had to say and assured me that she would work hard to achieve the brief I had given her. Obviously, I did not want to compromise her own distinctive style with too much input from me but her interpretation was beautiful. I really was not prepared for how stunning the finished article was. I love it - and am often asked who the artist is. Amanda has the rare ability to inject amazing emotion into her paintings - she is not simply technically brilliant - her work oozes character, charm and really captures the essence of the subject matter. 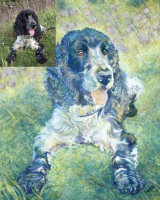 I would not hesitate in recommending her to anyone wishing to commission a painting of any type - but I can honestly say her animal portraits are second to none. 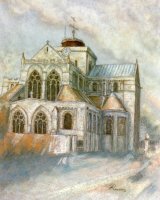 For my mother's birthday present I commissioned a (pastel) painting of Romsey Abbey. The result was an absolute joy. My mother was delighted as was I. Amanda was diligent and worked hard to give me exactly what I wanted. 20 years later the painting still holds pride of place.I have no hesitation in recommending Amanda.